Experience the grandeur of Spain on a guided half-day visit to El Escorial monastery and the Valley of the Fallen monument from Madrid. Discover why the Baroque-style El Escorial complex was considered the eighth wonder of the world, and admire the poignant sculptures of the Valley of the Fallen monument, erected in memory of the millions who died in the Spanish Civil War. You’ll gain insights into Spain's intriguing history at these symbolic monuments, reflecting the Spanish monarchy, church and 20th-century conflict, and have the option to include a half-day city tour of the highlights of Madrid. 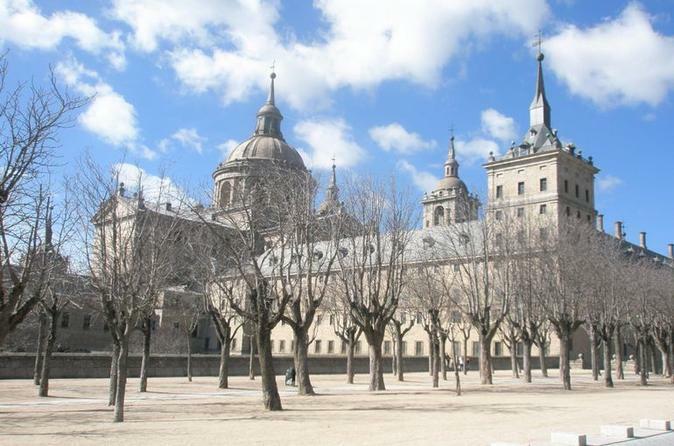 Departing Madrid by air-conditioned coach, travel to the Royal Seat of San Lorenzo de El Escorial, the Spanish monarchs’ historical residence and royal monastery, 28 miles (45 kilometers) northwest of Madrid. Your guided tour reveals the history behind this massive, regal complex of buildings, celebrated for their architectural perfection and a striking symbol of 16th-century Spanish power. Your tour of the World Heritage-listed royal complex takes you to the Royal Monastery of San Lorenzo El Real, built by King Philip II to house the remains of his parents, Charles I and Isabella of Portugal. The tour guides you through the monastery’s basilica, with its important religious relics, highly decorated altar and Baroque dome inspired by St Peter’s in Rome. Your guided tour of El Escorial also takes you to the austere but grand palace and the royal mausoleum known as the Pantheon of Kings, home to the marble tomb of Charles V, the first king of Spain. For insights into the construction of El Escorial, browse the Architecture Room’s collection of architects’ and builders’ equipment dating back hundreds of years. Visit the Weapons Room to see ornate armaments, and admire painted frescoes in the highly decorated library. Your tour continues from El Escorial to the Valley of the fallen, 6 miles (9.5 kilometers) to the north. Admire the vast basilica built into the side of a mountain, topped by a gigantic granite cross that towers 150 meters (500 feet) high and dominates the landscape. The monument was built by the Spanish dictator General Franco to commemorate the dead of Spain's Civil War. Take a guided tour inside the austerely modern basilica, with its vaulted crypt and sculpted angels, then look out from the surrounding esplanade of arches to admire the spectacular valley countryside surrounding the complex. Relax on the scenic return journey to Madrid, where your tour ends in the early afternoon, or where you'll continue your day of sightseeing on a guided 2.5 hour city tour highlighting Madrid’s famous monuments and landmarks (if upgrade option selected).